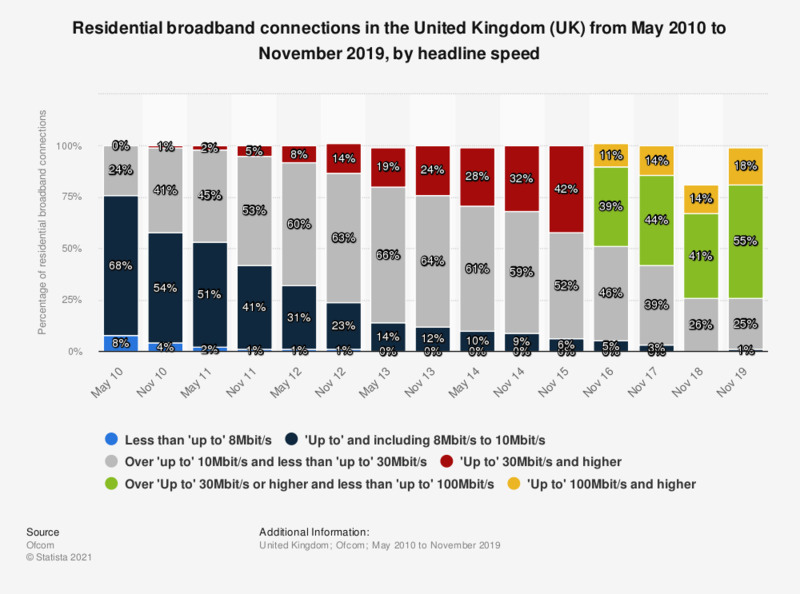 This statistic shows the residential broadband connections by headline speed in the United Kingdom (UK) from May 2010 to November 2017. In November 2017, the 'up to' 100Mbit/s and higher connections accounted for 14 percent of all connections. The source adds the following information: "The above ‘up to’ 10Mbit/s and less than ‘up to’ 30Mbit/s includes ADSL2+ connections which are not marketed using a connection speed." As of 2016, the variable "Up to 30Mbit/s and higher" was split into two new variables: "Up to 30 Mbit/s or higher and less than 'up to' 100Mbit/s" and "Up to 100Mbit/s and higher"